Council Regulation (EC) No 517/94 (3) has been substantially amended several times (4). Since further amendments are to be made, that Regulation should be recast in the interests of clarity. The common commercial policy should be based on uniform principles. Uniformity in the rules for imports should be ensured by laying down, as far as possible given the particular features of the economic system in the third countries in question, provisions similar to those applied under the common rules for other third countries. For a limited number of products originating in certain third countries, owing to the sensitivity of the textile sector of the Union, surveillance measures applicable at Union level should be laid down in this Regulation. Provision should be made for special rules for products re imported under the arrangements for economic outward processing. Annex III B to Regulation (EC) No 517/94 as amended by Commission Regulation (EC) No 1398/2007 (5) was emptied of its content. Therefore, it is appropriate to delete that Annex entirely. In the interest of clarity, the reference to that Annex in Article 4(2) should also be deleted. Some imports of certain textile products from certain third countries may have to be subject to Union surveillance, quantitative limits or other appropriate measures. If Union surveillance is applied, release for free circulation of the products in question should be made subject to presentation of a surveillance document meeting uniform criteria. That document should, on simple application by the importer, be issued by the authorities of the Member States within a certain period but without the importer thereby acquiring any right to import. The document should therefore be valid only during such period as the import rules remain unchanged. It is in the interests of the Union that the Member States and the Commission should make as full as possible an exchange of information resulting from Union surveillance. It is necessary to adopt precise criteria for assessing possible injury and initiating an investigations procedure while still allowing the Commission to introduce appropriate measures in urgent cases. To that end, detailed provisions should be laid down in respect of the initiation of investigations, the checks and inspections required, the hearing of those concerned, the treatment of information obtained and the criteria for assessing injury. It is necessary to provide for an appropriate system for administering Union quantitative restrictions. The administrative procedure should ensure that all applicants have fair access to quotas. In the interests of uniformity of rules for imports, the formalities to be carried out by importers should be simple and identical regardless of the place where the goods clear customs. It is, therefore, desirable to provide that any formalities should be carried out using forms corresponding to the specimen set out in Annex VI to this Regulation. Surveillance or safeguard measures confined to one or more regions rather than the whole of the Union may nevertheless prove necessary. However, such measures should be authorised only exceptionally and where no alternative exists. It is necessary to ensure that such measures are temporary and cause the minimum of disruption to the operation of the internal market. The provisions of this Regulation are without prejudice to Union or national legislation concerning professional secrecy. The safeguard measures necessitated by the interests of the Union should be implemented with due regard for existing international obligations. In order to simplify procedures for importers, it is necessary to provide for the possibility to extend the validity of, wholly or partly, unused import authorisations, instead of returning them to the competent authorities of the issuing Member States. In order to ensure the appropriate functioning of the system for the management of imports of certain textile products not covered by bilateral agreements, protocols or other arrangements, or by other specific Union import rules, the power to adopt acts in accordance with Article 290 of the Treaty should be delegated to the Commission in respect of amending the Annexes to this Regulation, altering the import rules and applying safeguard measures and surveillance measures in accordance with this Regulation. It is of particular importance that the Commission carry out appropriate consultations during its preparatory work, including at expert level. The Commission, when preparing and drawing up delegated acts, should ensure a simultaneous, timely and appropriate transmission of relevant documents to the European Parliament and to the Council. In order to ensure uniform conditions for the implementation of this Regulation, implementing powers should be conferred on the Commission. Those powers should be exercised in accordance with Regulation (EU) No 182/2011 of the European Parliament and of the Council (6). 1. This Regulation applies to imports of textile products falling within Section XI of Part Two of the Combined Nomenclature set out in Annex I to Council Regulation (EEC) No 2658/87 (7) and of other textile products, as listed in Annex I to this Regulation, originating in third countries and not covered by bilateral agreements, protocols or other arrangements, or by other specific Union import rules. 2. For the purposes of paragraph 1, textile products falling within Section XI of Part Two of the Combined Nomenclature set out in Annex I to Regulation (EEC) No 2658/87 shall be classified in categories as set out in Section A of Annex I to this Regulation, with the exception of products covered by Combined Nomenclature codes (CN codes) listed in Section B of Annex I to this Regulation. 3. For the purposes of this Regulation, the term ‘originating products’ and the methods for controlling the origin of those products shall be as defined by the relevant Union rules in force. Imports into the Union of products referred to in Article 1 and originating in third countries other than those listed in Annex II shall be free and therefore not subject to any quantitative restriction, without prejudice to the measures that may be taken under Chapter III and those that have been or may be taken under specific common import rules for the period during which those rules apply. 1. Imports into the Union of textile products listed in Annex III and originating in the countries indicated in that Annex shall be subject to the annual quantitative limits established in that Annex. 2. The release for free circulation in the Union of imports subject to the quantitative limits referred to in paragraph 1 shall be subject to the presentation of an import authorisation or equivalent document issued by the Member States' authorities in accordance with the procedure set out in this Regulation. The imports authorised in accordance with this paragraph shall be charged against the quantitative limits fixed for the calendar year for which quantitative limits have been fixed. 3. Any textile product referred to in Annex IV and originating in the third countries indicated therein may be imported into the Union provided that an annual quantitative limit is established by the Commission. Any such quantitative limit shall be based on previous trade flows or, where not available, duly justified estimations of such trade flows. The Commission shall be empowered to adopt delegated acts in accordance with Article 31 to amend the relevant Annexes to this Regulation with respect to the establishment of such annual quantitative limits. 4. Imports into the Union of textile products other than those covered by paragraphs 1 and 3 and originating in the countries indicated in Annex II shall be free, subject to the measures that may be taken under Chapter III and to measures that have been or may be taken under specific common import rules for the duration of those rules. 1. Without prejudice to measures that may be taken under Chapter III or under specific common import rules, re imports into the Union of textile products after processing in third countries other than those listed in Annex II shall not be subject to quantitative limits. 2. Notwithstanding paragraph 1, re imports into the Union of textile products listed in Annex V after processing in the third countries listed in that Annex shall only be made in accordance with the rules on economic outward processing in force in the Union and up to the annual limits fixed in Annex V.
1. The Committee referred to in Article 30 may consider any matter relating to the application of this Regulation raised by the Commission or at the request of a Member State. 2. The Commission shall be empowered to adopt delegated acts in accordance with Article 31 concerning the measures required to adapt Annexes III to VI where problems are detected as regards their effective functioning. 1. In respect of the textile products listed in Annex I, Member States shall notify the Commission, within 30 days following the end of each month, of the total quantities imported during that month by country of origin and CN code and the units, including where appropriate supplementary units of the CN code. The imports shall be broken down in accordance with the statistical procedures in force. 2. In order to enable the market trends in the products covered by this Regulation to be monitored, Member States shall communicate to the Commission, by 31 March each year, statistical data for the preceding year on exports. The statistical data relating to the production and the consumption of each product shall be forwarded to the Commission under arrangements to be determined subsequently in accordance with the examination procedure referred to in Article 30(3). 3. Where the nature of the products or particular circumstances so require, the Commission may, at the request of a Member State or on its own initiative, alter the time limits for communicating the information referred to in paragraphs 1 and 2 of this Article in accordance with the examination procedure referred to in Article 30(3). 4. In the urgent cases referred to in Article 13, the Member State or States concerned shall send the necessary import statistics and economic data to the Commission and the other Member States without delay. 1. Where it is apparent to the Commission that there is sufficient evidence to justify an investigation, with regard to the conditions of imports of products referred to in Article 1, the Commission shall initiate an investigation. The Commission shall inform Member States once it has determined that there is a need to initiate such an investigation. 2. In addition to the information supplied under Article 6, the Commission shall seek all information it deems necessary and shall endeavour to check that information with importers, traders, agents, producers, trade associations and organisations. The Commission shall be assisted in this task by staff of the Member State on whose territory these checks are being carried out, provided that this Member State so wishes. 3. The Member States shall provide the Commission, at its request and following procedures laid down by it, with the information at their disposal on developments in the market of the product being investigated. 4. The Commission may hear the interested natural and legal persons. Such parties must be heard where they have applied in writing within the period laid down in the notice published in the Official Journal of the European Union, showing that they are actually likely to be affected by the outcome of the investigation and that there are special reasons for them to be heard orally. 5. Where the information requested by the Commission is not supplied within a reasonable period, or the investigation is significantly impeded, findings may be made on the basis of the facts available. 6. Where the Commission has been asked to act by a Member State and it finds that there is insufficient evidence to justify an investigation, it shall, following consultations, inform the Member State of its decision. 1. At the end of the investigation, the Commission shall submit a report on the results to the Committee referred to in Article 30. 2. If the Commission considers that no Union surveillance or safeguard measures are necessary, it shall, acting in accordance with the examination procedure referred to in Article 30(3), decide to close the investigation, stating the main conclusions of the investigation. 3. If the Commission considers that Union surveillance or safeguard measures are necessary, it shall take the necessary decisions in accordance with Chapter III. 2. The Commission, its officials, Member States, and their officials shall not reveal any information of a confidential nature received pursuant to this Regulation, or any information provided on a confidential basis, without specific permission from the supplier of such information. Each request for confidentiality shall state the reasons why the information is confidential. However, if it appears that a request for confidentiality is unjustified and if the supplier of the information wishes neither to make it public nor to authorise its disclosure in general terms or in the form of a summary, the information concerned may be disregarded. 3. Information shall in any case be considered to be confidential if its disclosure is likely to have a significantly adverse effect upon the supplier or the source of such information. 4. Paragraphs 1, 2 and 3 shall not preclude reference by the Union authorities to general information and in particular to reasons on which decisions taken pursuant to this Regulation are based. The Union authorities shall, however, take into account the legitimate interest of the natural and legal persons concerned that their business secrets should not be divulged. 2. In conducting the investigation, the Commission shall take account of the particular economic system of the third countries referred to in Annex II. export capacity in the country of origin or export, already in existence or which will be operational in the foreseeable future, and the likelihood that the resulting exports will be to the Union. decide, for the purposes of monitoring the trend of these imports, to make certain imports subject to prior Union surveillance, in accordance with the advisory procedure referred to in Article 30(2). decide, for the purposes of monitoring the trend of these imports, to make certain imports subject to prior Union surveillance in accordance with the advisory procedure referred to in Article 30(2). 3. The measures referred to in paragraphs 1 and 2 shall, as a rule, be of a limited period of validity. 1. Where imports of textile products originating in third countries other than those listed in Annex II take place in such increased quantities, absolute or relative, and/or under such conditions, so as to cause serious injury or actual threat thereof to the Union production of like or directly competitive products, the Commission may, acting at the request of a Member State or on its own initiative, alter the import rules for the product in question by providing that it may be put into free circulation only on production of an import authorisation, the granting of which shall be governed by such provisions and subject to such limits as the Commission shall lay down. 2. Where imports of textile products originating in third countries listed in Annex II and liberalised at Union level take place in such increased quantities, absolute or relative, and/or under such conditions, so as to threaten to cause injury to the Union production of like or directly competitive products, or where the economic interests of the Union so require, the Commission may, acting at the request of a Member State or on its own initiative, alter the import rules for the product in question by providing that it may be put into free circulation only on production of an import authorisation, the granting of which shall be governed by such provisions and subject to such limits as the Commission shall lay down. 3. The Commission shall be empowered to adopt delegated acts in accordance with Article 31 concerning measures referred to in paragraphs 1 and 2 of this Article in order to alter the import rules for the product in question, including by amending the Annexes to this Regulation. 4. The measures referred to in this Article and Article 11 shall apply to every product which is put into free circulation after the entry into force of those measures. However, such measures shall not prevent the release for free circulation of products already shipped to the Union provided that the destination of such products cannot be changed and that those products which, under this Article and Article 11, may be put into free circulation only on production of a surveillance document are in fact accompanied by such a document. In accordance with Article 16, measures referred to in this Article and Article 11 may be confined to one or more regions of the Union. In cases of emergency where the absence of measures would cause irreparable damage to the Union industry, and where the Commission finds, upon its own initiative or on the request of a Member State, that the conditions set out in Article 12(1) and (2) are fulfilled, and considers that a given category of products listed in Annex I and not subject to any quantitative restriction should be subject to quantitative limits or prior or retrospective surveillance measures, and therefore imperative grounds of urgency so require, the procedure provided for in Article 32 shall apply to delegated acts referred to in Article 12(3) in order to alter the import rules for the product in question, including by amending the Annexes to this Regulation. 1. Products subject to prior Union surveillance or safeguard measures may be put into free circulation only on production of a surveillance document. In the case of prior Union surveillance measures, the surveillance document shall be issued free of charge by the competent authority designated by Member States within a maximum of 5 working days following receipt of an application to the national competent authority by any Union importers, regardless of their place of business in the Union, for any quantity requested. Such an application shall be deemed to be received by the national competent authority no later than 3 working days after submission, unless it is proven otherwise. The surveillance document shall be made out on a form corresponding to the specimen in Annex VI. Article 21 shall apply mutatis mutandis. In the case of safeguard measures, the surveillance document shall be issued in accordance with the provisions of Chapter IV. 2. Information other than that provided for in paragraph 1 may be required when the decision to impose surveillance or safeguard measures is taken. 3. The surveillance document shall be valid for imports throughout the territory in which the Treaty is applied under the conditions laid down in the Treaty, regardless of the issuing Member State, without prejudice, however, to measures taken under Article 16 of this Regulation. 4. The surveillance document shall not in any event be used beyond the expiry of the period which will be laid down at the same time and by means of the same procedure as the imposition of surveillance or safeguard measures, and which will take account of the nature of the products and other special features of the transactions. 5. Where a decision taken under the appropriate procedure referred to in Article 30 so requires, the origin of products under Union surveillance or safeguard measures must be proved by a certificate of origin. This paragraph shall be without prejudice to other provisions concerning the production of any such certificate. 6. Where the product under prior Union surveillance is subject to regional safeguard measures in a Member State, the import authorisation granted by that Member State may replace the surveillance document. make the issue of the surveillance document subject to certain conditions and, as an exceptional measure, subject to the insertion of a revocation clause, or, with the frequency and for the length of time indicated by the Commission, to the prior information and consultation procedure referred to in Articles 6 and 8. Where on the basis, in particular, of the factors referred to in Articles 10, 11 and 12, it emerges that the conditions laid down for the adoption of surveillance or safeguard measures are met in one or more regions of the Union, the Commission, after having examined alternative solutions, may exceptionally authorise the application of surveillance or safeguard measures limited to the region or regions concerned if it considers that such measures applied at that level are more appropriate than measures applied throughout the Union. Those measures must be temporary and, insofar as possible, must not disrupt the operation of the internal market. Those measures shall be adopted in accordance with the appropriate procedure applicable to measures to be adopted pursuant to Articles 10, 11 and 12. 1. The competent authorities of the Member States shall notify the Commission of the quantities covered by the requests for import authorisations which they have received. 2. The Commission shall notify its confirmation that the requested quantities are available for importation in the chronological order in which the notifications of the Member States have been received (‘first come, first served’ basis). 3. Where there is reason to believe that anticipated requests may exceed the quantitative limits, the Commission may, in accordance with the examination procedure referred to in Article 30(3), divide the quantitative limits into tranches or fix maximum amounts per allocation. The Commission may, in accordance with the examination procedure referred to in Article 30(3), reserve a proportion of a specific quantitative limit for requests supported by evidence of past import performance. 4. The notifications referred to in paragraphs 1 and 2 shall be communicated electronically within the integrated network set up for this purpose, unless for imperative technical reasons it is necessary to use other means of communication temporarily. 5. The competent authorities shall notify the Commission immediately after being informed of any quantity that is not used during the validity of the import authorisation. Such unused quantities shall automatically be transferred into the remaining quantities of the total Union quantitative limit. 6. The Commission may, in accordance with the examination procedure referred to in Article 30(3), take any measure necessary to implement this Article. 1. All Union importers, regardless of where they are established in the Union, may submit authorisation applications to the competent authority of the Member State of their choice. 2. For the purposes of the second sentence of Article 17(3), importers' applications shall, where necessary, be accompanied by documentary evidence of previous imports for each category and each third country concerned. The competent authorities of the Member States shall issue import authorisations within 5 working days of notification of the Commission decision or within the time limit set by the Commission. Those authorities shall inform the Commission that import authorisations have been issued within 10 working days of issuing the authorisations. Where necessary and in accordance with the examination procedure referred to in Article 30(3), import authorisations may be made conditional upon the lodging of a security. 1. 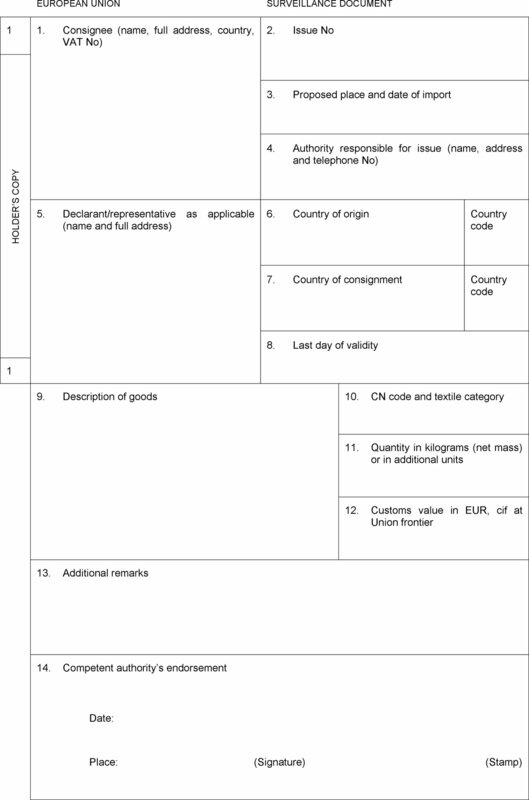 Without prejudice to measures taken under Article 16, import authorisations shall authorise the import of products which are subject to quantitative limits and shall be valid throughout the territory in which the Treaty is applied under the conditions laid down in the Treaty, regardless of the place of import mentioned in the applications by importers. When the Union introduces temporary limits for one or more of its regions, in accordance with Article 16, those limits shall not preclude the importation into the region(s) concerned of products shipped before the date of introduction of those limits. 2. The period of validity of import authorisations issued by the competent authorities of the Member States shall be 6 months. This period of validity may be modified where necessary, in accordance with the examination procedure referred to in Article 30(3). 3. Applications for import authorisations shall be drawn up on forms conforming to a specimen the characteristics of which shall be established in accordance with the examination procedure referred to in Article 30(3). The competent authorities may, under the conditions fixed by them, allow application documents to be submitted by electronic means. However, all documents and evidence shall be available to the competent authorities. 4. Import authorisations may be issued by electronic means at the request of the importer concerned. At the duly motivated request of that importer, and provided that paragraph 3 has been complied with, an import authorisation issued by electronic means may be replaced by an import authorisation in paper form by the competent authority of the same Member State which issued the original import authorisation. However, that authority shall only issue an import authorisation in written form after having ensured that the authorisation by electronic means has been cancelled. Any measure necessary to implement this paragraph may be adopted in accordance with the examination procedure referred to in Article 30(3). 5. At the request of the Member State concerned, textile products in the possession of the competent authorities of that Member State, particularly in the context of bankruptcy or similar procedures, for which a valid import authorisation is no longer available, may be released into free circulation in accordance with the examination procedure referred to in Article 30(3). Without prejudice to the specific provisions to be adopted in accordance with the examination procedure referred to in Article 30(3), import authorisations shall not be loaned or transferred, whether for a consideration or free of charge, by the person in whose name the document was issued. The validity of import authorisations which are wholly or partly unused may be extended, if enough quantities are available, in accordance with the examination procedure referred to in Article 30(3). The competent authorities of the Member States shall inform the Commission, within 30 days following the end of each month, of the quantities of products subject to Union quantitative limits which have been imported during the preceding month. Re imports into the Union of textile products listed in the table set out in Annex V, effected in accordance with the rules on economic outward processing in force in the Union, shall not be subject to the quantitative limits referred to in Articles 2, 3 and 4 where they are subject to the specific quantitative limits given in the table set out in Annex V and have been re imported after processing in the listed corresponding third country for each of the quantitative limits specified. 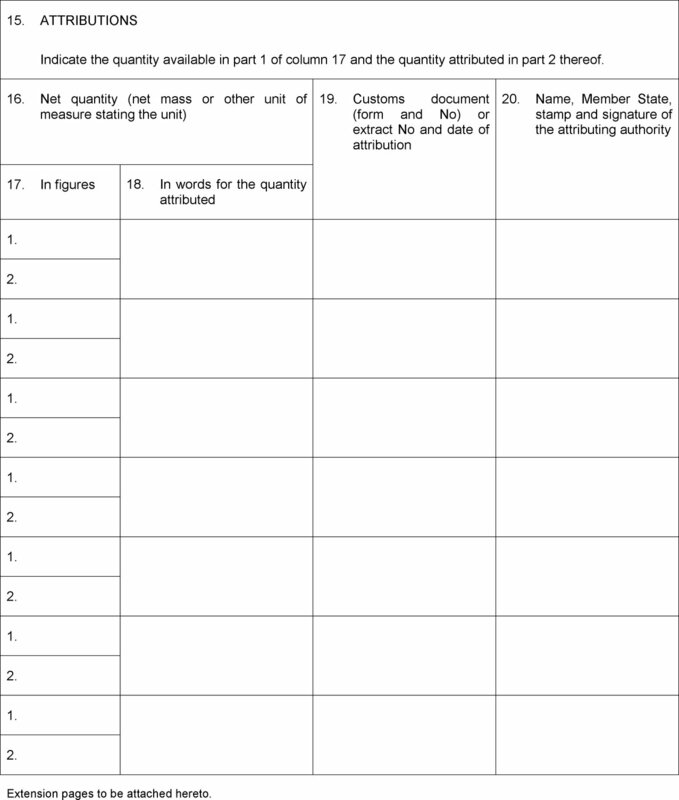 The Commission shall be empowered to adopt delegated acts in accordance with Article 31 to subject re imports not covered by this Chapter and Annex V to specific quantitative limits, provided that the products in question are subject to the quantitative limits laid down in Articles 2, 3 and 4. Where a delay in the imposition of specific quantitative limits to re imports of outward processing trade would cause damage to the Union industry which would be difficult to repair and therefore imperative grounds of urgency so require, the procedure provided for in Article 32 shall apply to delegated acts adopted pursuant to the first paragraph of this Article. 1. The Commission shall be empowered to adopt delegated acts in accordance with Article 31 to effect transfers between categories of products set out in section A of Annex I and advance use or carry-over of portions of specific quantitative limits referred to in Article 26 from one year to another. Where a delay in the imposition of measures referred to in the first subparagraph would cause damage to the Union industry by impeding outward processing trade given the legal requirement to operate such transfers from one year to the next, and such damage would be difficult to repair, and therefore imperative grounds of urgency so require, the procedure provided for in Article 32 shall apply to delegated acts adopted pursuant to the first subparagraph of this paragraph. advance use of a specific quantitative limit of up to 7,5 % of the quantitative limit established for the actual year of utilisation. 3. The Commission shall be empowered to adopt delegated acts in accordance with Article 31 to adjust the specific quantitative limits where there is a need for additional imports. Where there is a need for additional imports and where a delay in the adjustment of the specific quantitative limits would cause damage to the Union industry by impeding access to such required additional imports which would be difficult to repair, and therefore imperative grounds of urgency so require, the procedure provided for in Article 32 shall apply to delegated acts adopted pursuant to the first subparagraph of this paragraph..
4. The Commission shall inform the third country or third countries concerned of any measures taken pursuant to this Article. 1. 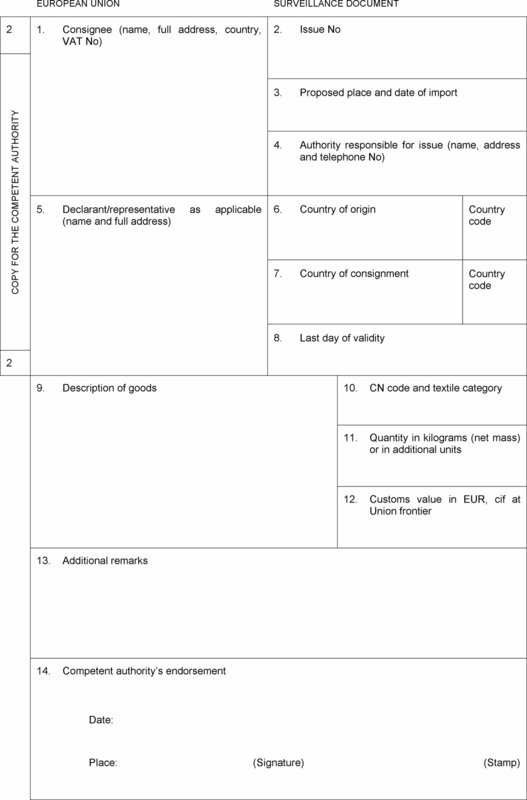 For the purpose of applying Article 25, the competent authorities of the Member States shall, before issuing prior authorisations in accordance with the relevant Union rules on economic outward processing, notify the Commission of the amounts of the requests for authorisations which they have received. The Commission shall notify its confirmation that the requested amounts are available for re importation within the respective Union limits in accordance with the relevant Union rules on economic outward processing. an applicant under the third subparagraph of Article 3(4) or under Article 3(5) of Regulation (EC) No 3036/94. 3. The notifications referred to in paragraphs 1 and 2 shall be communicated electronically within the integrated network set up for this purpose, unless for imperative technical reasons it is necessary to use other means of communication temporarily. 4. If the requested amounts are available, the Commission shall confirm to the competent authorities of the Member States the full amount indicated in the requests notified for each category of products and each third country concerned. Notifications presented by Member States for which no confirmation can be given because the amounts requested are no longer available within the Union quantitative limits, shall be stored by the Commission in the chronological order in which they have been received and confirmed in the same order as soon as further amounts become available through the application of automatic transfers provided for in Article 27. 5. The competent authorities shall notify the Commission without delay after being informed of any quantity that is not used during the duration of validity of the import authorisation. Such unused quantities shall automatically be re credited to the quantities within the Union quantitative limits not set aside pursuant to the first subparagraph of Article 3(4), or to the fifth subparagraph of Article 3(5), of Regulation (EC) No 3036/94. The quantities for which a renunciation has been made pursuant to the third sub paragraph of Article 3(4) of Regulation (EC) No 3036/94 shall automatically be added to the quantities within the Union quota that are not set aside pursuant to the first subparagraph of Article 3(4), or to the fifth sub paragraph of Article 3(5), of that Regulation. All such quantities as outlined in the preceding subparagraphs shall be notified to the Commission in accordance with paragraph 3. The competent authorities of the Member States shall provide the Commission with the names and addresses of the authorities competent to issue the prior authorisations referred to in Article 28 together with specimens of the stamp impressions used by them. 1. The Commission shall be assisted by the Textile Committee. That Committee shall be a committee within the meaning of Regulation (EU) No 182/2011. 2. The power to adopt delegated acts referred to in Article 3(3), Article 5(2), Article 12(3), Article 13, Article 26, Article 27(1) and (3) and Article 35 shall be conferred on the Commission for a period of 5 years from 20 February 2014. The Commission shall draw up a report in respect of the delegation of power not later than 9 months before the end of the 5 year period. The delegation of power shall be tacitly extended for periods of an identical duration, unless the European Parliament or the Council opposes such extension not later than 3 months before the end of each period. 3. The delegation of power referred to in Article 3(3), Article 5(2), Article 12(3), Article 13, Article 26, Article 27(1) and (3) and Article 35 may be revoked at any time by the European Parliament or by the Council. A decision to revoke shall put an end to the delegation of power specified in that decision. It shall take effect the day following the publication of the decision in the Official Journal of the European Union or at a later date specified therein. It shall not affect the validity of any delegated acts already in force. 5. A delegated act adopted pursuant to Article 5(2) and Articles 13 and 35 shall enter into force only if no objection has been expressed either by the European Parliament or the Council within a period of 2 months of notification of that act to the European Parliament and the Council or if, before the expiry of that period, the European Parliament and the Council have both informed the Commission that they will not object. That period shall be extended by 2 months at the initiative of the European Parliament or of the Council. 6. A delegated act adopted pursuant to Article 3(3), Article 12(3), Article 26 and Article 27(1) and (3) shall enter into force only if no objection has been expressed either by the European Parliament or the Council within a period of 2 months of notification of that act to the European Parliament and the Council or if, before the expiry of that period, the European Parliament and the Council have both informed the Commission that they will not object. That period shall be extended by 4 months at the initiative of the European Parliament or of the Council. 2. Either the European Parliament or the Council may object to a delegated act in accordance with the procedure referred to in Article 31(5) or (6). In such a case, the Commission shall repeal the act without delay following the notification of the decision to object by the European Parliament or by the Council. 1. This Regulation shall not preclude the fulfilment of obligations arising from special rules contained in agreements concluded between the Union and third countries. formalities introduced pursuant to international agreements in accordance with the Treaty. The Member States shall inform the Commission of the measures or formalities to be introduced or amended in accordance with the first subparagraph. In the event of extreme urgency, the national measures or formalities in question shall be communicated to the Commission immediately upon their adoption. The Commission shall include information on the implementation of this Regulation in its annual report on the application and implementation of trade defence measures presented to the European Parliament and to the Council pursuant to Article 22a of Council Regulation (EC) No 1225/2009 (9). The Commission shall be empowered to adopt delegated acts in accordance with Article 31 to amend the relevant Annexes where necessary to take into account the conclusion, amendment or expiry of agreements or arrangements with third countries or amendments made to Union rules on statistics, customs arrangements or common rules for imports. Regulation (EC) No 517/94 is repealed. Done at Strasbourg, 9 June 2015. (1) Opinion of 10 December 2014 (not yet published in the Official Journal). (2) Position of the European Parliament of 29 April 2015 (not yet published in the Official Journal) and decision of the Council of 28 May 2015. (3) Council Regulation (EC) No 517/94 of 7 March 1994 on common rules for imports of textile products from certain third countries not covered by bilateral agreements, protocols or other arrangements, or by other specific Community import rules (OJ L 67, 10.3.1994, p. 1). (5) Commission Regulation (EC) No 1398/2007 of 28 November 2007 amending Annexes II, III B and VI to Council Regulation (EC) No 517/94 on common rules for imports of textile products from certain third countries not covered by bilateral agreements, protocols or other arrangements, or by other specific Community import rules (OJ L 311, 29.11.2007, p. 5). (7) Council Regulation (EEC) No 2658/87 of 23 July 1987 on the tariff and statistical nomenclature and on the Common Customs Tariff (OJ L 256, 7.9.1987, p. 1). (8) Council Regulation (EC) No 3036/94 of 8 December 1994 establishing economic outward processing arrangements applicable to certain textiles and clothing products reimported into the Community after working or processing in certain third countries (OJ L 322, 15.12.1994, p. 1). (9) Council Regulation (EC) No 1225/2009 of 30 November 2009 on protection against dumped imports from countries not members of the European Community (OJ L 343, 22.12.2009, p. 51). Without prejudice to the rules for the interpretation of the Combined Nomenclature, the wording of the description of goods is considered to be of indicative value only, since the products covered by each category are determined, within this Annex, by CN codes. Where there is an ‘ex’ symbol in front of a CN code, the products covered in each category are determined by the scope of the CN code and by that of the corresponding description. Garments which are not recognisable as being garments for men or boys or as being garments for women or girls are classified with the latter. Where the expression ‘babies’ garments' is used, this is meant to cover garments up to and including commercial size 86. 10, 22, 23, 32, 33, 34, 35, 38, 40, 41, 42, 49, 50, 53, 54, 55, 58, 62, 63, 65, 66, 67, 72, 84, 85, 86, 88, 90, 91, 93, 97, 99, 100, 101, 111, 112, 113, 114, 120, 121, 122, 123, 124, 130, 133, 134, 135, 136, 137, 138, 140, 141, 145, 146A, 146B, 146C, 149, 150, 153, 156, 157, 159, 160. Extension pages to be attached hereto. Indicate the quantity available in part 1 of column 17 and the quantity attributed in part 2 thereof. (OJ L 67, 10.3.1994, p. 1). (OJ L 159, 28.6.1994, p. 14). (OJ L 183, 19.7.1994, p. 9). (OJ L 279, 28.10.1994, p. 7). (OJ L 297, 18.11.1994, p. 6). (OJ L 315, 8.12.1994, p. 2). (OJ L 128, 13.6.1995, p. 1). (OJ L 79, 29.3.1996, p. 1). (OJ L 188, 27.7.1996, p. 4). (OJ L 255, 9.10.1996, p. 4). (OJ L 199, 26.7.1997, p. 6). (OJ L 307, 2.12.1999, p. 14). (OJ L 2, 5.1.2000, p. 51). (OJ L 333, 29.12.2000, p. 60). (OJ L 303, 20.11.2001, p. 17). (OJ L 146, 4.6.2002, p. 1). (OJ L 192, 20.7.2002, p. 1). (OJ L 204, 13.8.2003, p. 3). (OJ L 212, 22.8.2003, p. 46). (OJ L 342, 30.12.2003, p. 21). (OJ L 326, 29.10.2004, p. 25). (OJ L 162, 23.6.2005, p. 37). (OJ L 337, 5.12.2006, p. 12). (OJ L 311, 29.11.2007, p. 5). (OJ L 338, 19.12.2009, p. 58). (OJ L 335, 17.12.2011, p. 42). (OJ L 336, 8.12.2012, p. 55). (OJ L 18, 21.1.2014, p. 52).